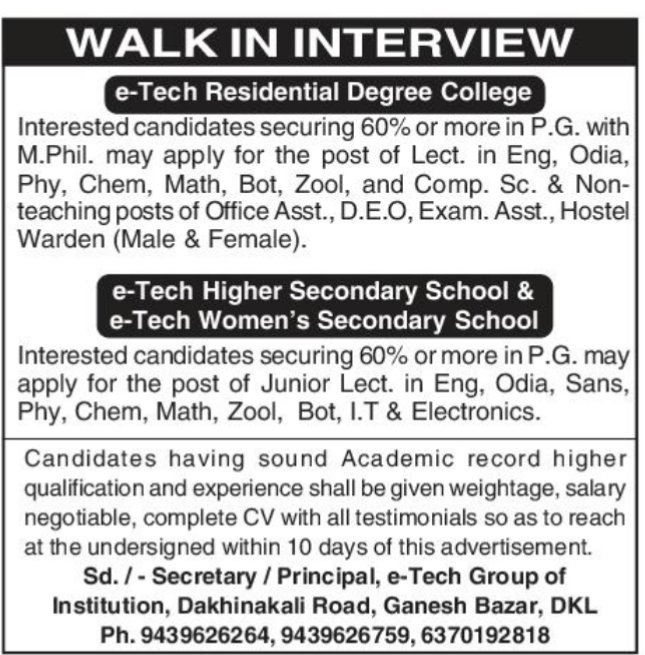 e-Tech Residential Degree College, Dhenkanal has advertised in the Sambad newspaper for recruitment of Teaching Faculty- Lecturer,Junior Lecturer jobs vacancies. Interested and eligible job aspirants are requested to apply with in 10 days.Check out further more details below. 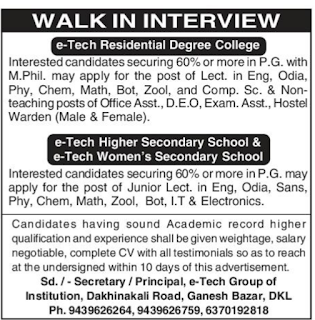 Name of the College : e-Tech Residential Degree College, Dhenkanal, e-Tech Higher Secondary School,e-Tech Women's secondary school. About College: Under the Vidyaniketana Charitable Trust,the challeging demands of 21st century gets shaped in the safety plans of e-Tech +2 Science Residential College. The Fragrance it spreads has reached all dimensions of academic with its new concept of quality education in the level of +2 Science in Odisha. It takes the pride of establishing its swlf in the rank 2nd among the +2 Science Residential Colleges in Odisha within a period of just five years & ventures to grow aggresively where the sky is limit. now it welcome the 7th Batch with a great hillary. Lecturer- Candidates with 60% of marks or more in P.G with M.Phil. Having sound academic record higher qualifications and experience will be given weight age ,complete CV with all testimonials so as to reach undersigned with in 10 days. Reference: Recruitment Notification / Career Job Opportunities notice for Teaching Faculty - Lecturer ,Junior Lecturer on Sambad newspaper Dated 6th July 2018.